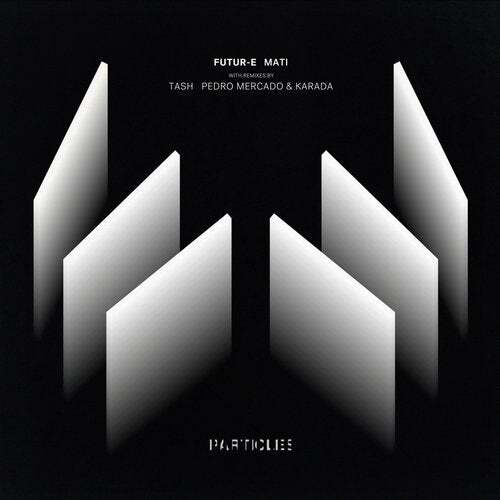 An artist with a long association with electronic music, Futur-E returns to Particles with "Mati". Remixes come courtesy of talented artists from Greece and Belgium. From the ancient and historically significant city of Elefsis, Stavros Karavasilis has created a thoroughly modern name for himself via his Futur-E moniker. With DJ performances across local Greek beach bars, a production career has seen Futur-E feature on such celebrated imprints as Tulipa, Traum and MNL with a double century of production credits. Reprising an appearance on the "Spring Particles 2016" compilation, the title track is characterised by a strong techno beat and machine-gun fire hats that provide a firm foundation for a rich melodic collage. Flowing effortlessly across seven minutes a combination of heavily-delayed glissando lead and textured chord progression hits its stride pre and post-breakdown with a sixteenth repeated clave adding additional percussive interest in the third movement. A riff of tuned toms provides the rhythmic framework for "Pantheon" to flourish alongside strong beat and high-energy shakers. A similar analogue path makes its presence felt with harmonically rich riff providing a sinister edge as a rolling groove evolves into the third movement from where the central motif then appears once more. A hugely respected name within the underground dance fraternity with his renowned Movement Recordings imprint and global DJ performances, Tassos Papagiannoulis has caused a considerable stir with Tash alter-ego. Performances alongside the likes of Sasha, Guy J, Nick Warren and Hernan Cattaneo have kept audiences enraptured while production work has found the Greek native allied to over 400 production credits for the likes of Stripped Digital, Balkan Connection and his own Movement imprint. A single remix of Nick Hogendoorn for Particles in 2013 is now followed by a second as Tash takes the central themes of Futur-E's "Mati" as rolling bass and cadenced clave groove make their presence felt in the early movements. Flowing easily, the melodic themes of the original make their mark as subtle new production material from Tash's arsenal blend effortlessly with Futur-E's work. Established artists in their own right Belgian duo, Pedro Mercado and Karada have witnessed DJ performances across Europe for Mercado, and a production debut for Karada on the globally renowned, Lost Language. Together, a production career has seen the duo with a double century of combined credits for a plethora of high-profile imprints that includes Parquet, Kling Klong and City Life. September 2018's "Parallel Universe" marked an impressive original EP debut while a pair of remixes of Kynan Cosma and Forniva and Desaturate is now joined by a third. Creating a high-energy interpretation of "Pantheon", Pedro Mercado and Karada drive their track forwards with clever new melodic phrases that entwine intelligently alongside Futur-E's original with drive and hypnotic verve, reaching an early climax at the mid-point. Acid squelches and rich pads add depth and texture before the pace is quickened again in the third movement with rhythm and melody coursing through the track's second half.